Looks like the controversies shrouding Dasavatharam’s script is far from over. Earlier, Chennai high court turned down the petition filed by assistant director Senthil Kumar alleging that the story of the movie belongs to him. Following which, Senthil Kumar filed another petition in the court stating that he has solid grounds for his claim that the movie is based on his story. He further requested the court for a preview of the movie and also sought ban for the movie from being released. Chennai high court admitted the petition and after hearing, a bench of judges including A.B. Shah and Jyothimani ordered the producers of Dasavatharam and the claimant Senthil Kumar for the English translation of their respective versions of the script. 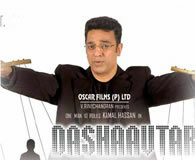 Dasavatharam’s fate will be known when the judges review both the parties’ scripts. This is considered to be a major setback for Dasavatharam that is being shot in jet pace for a Diwali release later this year.